As a consultant I have found myself collecting tips and tricks and throwing them into my kit bag over the years. But a recent piece I thought I’d share made me realise that sometimes there is a need to empty the kit bag and throw a heap of it out. It’s much like the gym or baby bag – over time stuff accumulates that was once new and shiny but is now well and truly past it’s use by date (the reaction is an ewwww, yuk; Why is that there; and what was that?!?!?). So we throw it out. I know I’m not the only one with their special bag of tricks that is accumulated over different projects. We find ourselves doing the same activities repeatedly and so automation or some other neat trick is implemented. We find ourselves keeping a copy (assuming allowed to) or taking note of the solution and approach to have it up our sleave when we find ourselves in a similar situation at a different client. But if we are not careful, we can find our once neat trick now a mess for future clients. A better, more elegant solution becomes available, but we are too set in our old ways and don’t seek out that knowledge. After all, we solved that problem years ago. If it ain’t broke, then why do we need to concern ourselves finding better solutions? 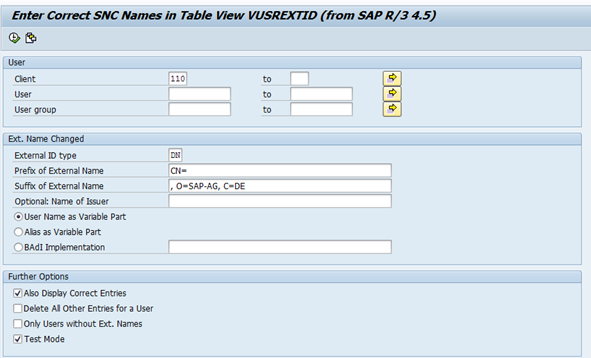 I have now thrown out of my kit bag my ECATS and Scripts to map the user SNC value (transaction EXTID_DN) for SAP Business Client SSO requirements as well as manually entering SNC tab in the user master. These two manual steps of which one required a script have been replaced with SAP standard transactions codes scheduled to run periodically in background. The winning transactions are /IWFND/BULK_USER_MAP and SNC1. SNC1 had been around of ages but I never paid much attention but the transaction /IWFND/BULK_USER_MAP snuck in under Gateway/Fiori namespace so I only stumbled on it recently. Over to you – what’s have you thrown out of your kitbag recently? Is it time you go through yours to see what should be retired? Do you have a time limit as to when you question the validity of a solution? Do you find yourself turning up and discovering outdated solutions on your system and get frustrated that no one has suggesting implementing the newer options? P.s a bit of a cross post between two tags but I thought this could be a good skills discussion. I have had too many things in my bag for awhile too. I must go back through them again. Here are some of the things, I’ve tossed out. They are pretty simple. But here you go. And so many more… Of course I haven’t cleaned out my bag of tricks so I’ll have to do that and either write a blog or comment here depending on how long it is. Thanks, Colleen, and an important post! I can recall right back to my very first implementation (as a customer, before I became a consultant, which was before I became a customer again), when our consulting partner recommended that we apply support packs to our system one at a time, sequentially, rather than bundling them together into a single stack as SAP recommends (and definitely recommended then, too). Even at the time, as a newbie, I thought this was strange advice, and it was certainly based upon an older experience of the consultant’s that was no longer relevant. We encountered similar things in later implementations, as well, when consultants would give us well-meaning advice that made sense on earlier versions of the software, but it really didn’t apply anymore. Of course, this makes sense that this happens, and certainly did in the late 90s through the 2000s, when a typical implementation would be about a year, and SAP came up with a new release about once a year, and so every time a consultant approached a new project, it almost always would be on a new release they had not previously seen. How could it be any other way? Even now, as a customer, having upgraded our systems multiple times, I have to be wary that my own “best practices” are not now outmoded and no longer recommended, and it’s a difficult thing to stay on top of. This SNC trick is a good one! Good point about the inclusion of Notes to check within tcodes like SU25. I have noticed this, and it’s quite helpful. I have been using form get_data in my throw-away reports, following the misscacetion that from a method I cannot easily acces select-optins.